The Fas-N-Fast Newel Mounting System is perfect for installing our solid wood newel posts, specifically for use with Cable Railing Systems. Each disk is 2″ in diameter with 6 pre-drilled holes. You first drill a 2″ circular hole in the bottom of the newel post at the depth to accept both of the disks. One of the disks is mounted the floor, and the other is mounted inside this hole in the bottom of the newel. The two parts are threaded together until they are secure. Depending on the hardness of the wood, and location of the post (Tensioning post vs intermediate), you’ll want to select different screws to ensure the system is strong enough for your specific application. You might have to use shorter screws in two of the six holes going into the bottom of the post to ensure the screws don’t interfere with the cable & tensioning systems. Can I secure this to a cement slab? Are these able to connect posts to concrete? The Fas-N-Fast Newel Mounting System is designed to mount solid wood newels to wood surfaces. We do not have a fastener recommendation for mounting to concrete. 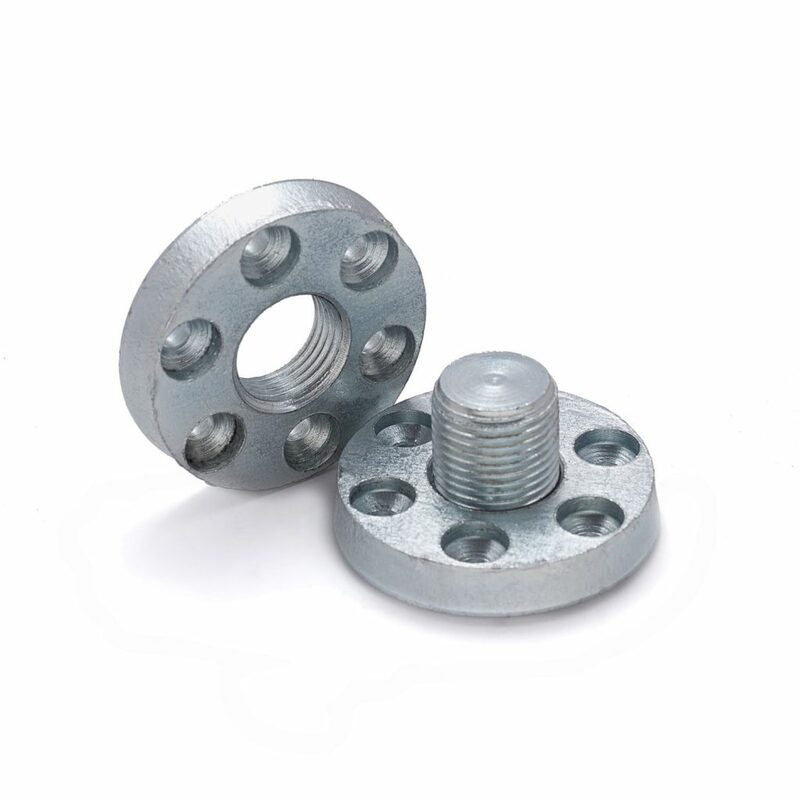 We would recommend consulting a contractor on which fastener would best suit the needs of your project. Is there an installation guide for this product? Thanks for the question Israel. We don’t have a printable installation guide for this product, but it is fairly simple. You first drill a 2″ circular hole in the bottom of the newel post at the depth to accept both of the disks. One of the disks is mounted the floor, and the other is mounted inside this hole in the bottom of the newel. The two parts are threaded together until they are secure. If you need more direction or have any other questions, you can give us a call at (866) 226 6536. When you screw the two parts together, how do you assure that when tight the newell is in the correct position? It would seem it could be off square. Thanks for the question Glenn. There will be a certain degree of play when you tighten it down on the threaded rod, but other than that, you’ll have to do a little trial and error to make sure it lines up properly.